In suburban Pennsylvania, Keller Dover (Hugh Jackman) his wife Grace, their teenage son Ralph and young daughter Anna attend a Thanksgiving dinner at the home of their friends, Franklin Birch (Terrence Howard) and his wife Nancy (Viola Davis) their teenage daughter Eliza and young daughter Joy. The four children go for a walk in the neighborhood and approach an RV that is parked outside a house nearby. There is music playing, which suggests there is somebody inside. After dinner, Anna and Joy go missing. Detective Loki (Jake Gyllenhaal) is informed and starts a search. He locates the RV, which is found parked at a gas station. As police surround the vehicle, the driver, Alex Jones, starts the vehicle and crashes into a nearby tree. He is subsequently arrested and taken away. Alex has the IQ of a 10-year-old, and appears confused when being questioned at the police station. His vehicle is searched by forensics but nothing is found relating to the girls. Pursuing other leads, Loki discovers a corpse in the basement of Patrick Dunn, a priest. Dunn admits that he killed the man because the man confessed he was "waging a war against God" and had killed 16 children and said that he would kill more. As the search continues, Dover is informed that Alex has been released and attacks him outside the police station. Alex whispers to him, "They didn't cry until I left them". Since Loki won't re-arrest Alex, and Dover sees Alex hurting his Aunt's dog and then hears him singing the same ditty as Anna, Dover abducts him, locks him up in his late father's abandoned home and tortures him—with the help of a reluctant Franklin - to force him to talk. First he beats him, but Alex says nothing. Dover ties him up in the shower and uses plywood to enclose him in the dark. He adjusts the water so the shower is either scorching hot or freezing to further torture him. At a candlelight vigil for the girls, Loki sees a suspicious hooded man, who flees when Loki approaches him. Later on, the man breaks into both families' houses but leaves without doing anything. Loki follows Dover to where Alex is being held prisoner but doesn't find him, as Dover fabricates a story about stopping over in the building so he's able to drink to ease his suffering without his wife knowing. A store clerk recognizes the hooded man from a composite drawing and reports him to Loki after seeing him buying children's clothing. The suspect, Bob Taylor, is later arrested at his home, where the walls are covered in drawings of mazes. Loki then finds crates filled with maze books, live snakes, and bloodied children's clothing, including items belonging to the missing girls. They discover Taylor had himself been abducted as a child. At the police station, Taylor confesses to the abduction but during a physical altercation with Loki and two other officers, he snatches a gun and kills himself without revealing any more information. The police conclude that Taylor was a fantasist and had no involvement with the disappearances; he stole the clothes from the girls' homes and bloodied them with pig's blood to recreate abductions. Dover continues to torture Alex, who incoherently talks about escaping from a maze. Dover visits Alex's aunt, Holly, who tells him that Alex is the way he is because he had an accident with snakes her husband kept as pets when he was younger. She also says that she and her husband were religious until their young son died of cancer. Back at the police station, Loki becomes frustrated with getting nowhere with the case until he matches a maze Taylor drew while in custody to the maze necklace worn by the man Patrick Dunn killed in his basement. Suddenly, Joy Birch is found drugged but alive. Dover visits her in the hospital to ask for information. Her memories are confused but she mumbles, "You were there", to Dover. 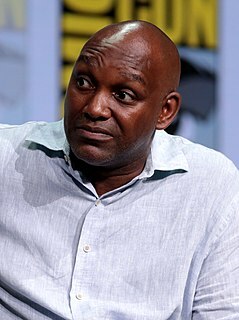 He then realizes that Joy may have heard his voice at the Joneses' house when he visited Holly, and runs from the police. Loki searches for Dover at the apartment building and discovers Alex. Dover then goes back to the Joneses' house to get information from Holly, but she pulls a gun on him. She explains that, before her husband left her, they abducted many children as part of their "war on God" to avenge their son's death. Alex was the first child they abducted, followed by Taylor. Alex just took the girls for a ride, and Holly decided to abduct them. Holly shoots Dover in the leg and imprisons him in a concealed pit in her yard, where he finds the emergency whistle belonging to his daughter. Loki goes to the Joneses' house to tell her that her nephew has been found. He finds a photograph of Holly's husband wearing the same maze necklace found on the body in the priest's basement, making him her missing husband. Loki finds Holly drugging Anna and they exchange gunfire. Loki is wounded and Holly is killed. Loki then rushes Anna to the hospital where she reunites with her mother. Alex is reunited with his parents after surviving the torture. A day later, Loki returns to the Joneses' house where the authorities have begun excavating the property. As the forensic investigators depart for the night, Loki hears Dover's labored blowing on the whistle from the pit. Aaron Guzikowski wrote the script based on a short story he wrote, partially inspired by "The Tell-Tale Heart", involving "a father whose kid was struck by a hit and run driver and then puts this guy in a well in his backyard." After he wrote the spec, many actors and directors entered and exited the project, including actors Christian Bale and Leonardo DiCaprio and directors Antoine Fuqua and Bryan Singer. Ultimately Guzikowski would credit producer Mark Wahlberg for getting the project on its feet, stating, "He was totally pivotal in getting the film made. That endorsement helped it get around." Principal photography began in Georgia in February 2013. Prisoners premiered at the 2013 Telluride Film Festival and was released theatrically in Canada and the United States on September 20, 2013. It was originally rated NC-17 by the MPAA for substantial disturbing violent content and explicit images; after being edited, it was re-rated R for disturbing violent content including torture, and language throughout. 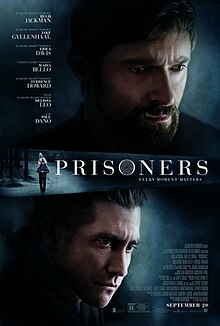 Prisoners opened in North America on September 20, 2013, in 3,260 theaters and grossed $20,817,053 in its opening weekend, averaging $6,386 per theater and ranking #1 at the box office. After 77 days in theaters, the film ended up earning $61,002,302 domestically and $61,124,385 internationally, earning a worldwide gross of $122,126,687, above its production budget of $46 million. On review aggregator website Rotten Tomatoes, the film has an approval rating of 82% based on 238 reviews, with a rating average of 7.3/10. The website's critical consensus states: "Prisoners has an emotional complexity and a sense of dread that makes for absorbing (and disturbing) viewing." On Metacritic, the film has a weighted average score of 74 out of 100, based on 46 critics, indicating "generally favorable reviews". Audiences polled by CinemaScore initially gave the film a grade "B+" on an A+ to F scale. However Warner Bros asked for a recount by the service and later said the film received a grade "A–". Christopher Orr of The Atlantic wrote: "Ethical exploration or exploitation? In the end, I come down reservedly on the former side: the work done here by Jackman, Gyllenhaal, and especially Villeneuve is simply too powerful to ignore." Ed Gibbs of The Sun Herald wrote: "Not since Erskineville Kings, in 1999, has Hugh Jackman appeared so emotionally exposed on screen. It is an exceptional, Oscar-worthy performance." Peter Travers of Rolling Stone wrote that Gyllenhaal was "exceptional" and that "Villeneuve takes his unflashy time building character and revealing troubled psyches in the most unlikely of places." The film was a second runner-up for the BlackBerry People's Choice Award at the 2013 Toronto International Film Festival, behind Philomena and 12 Years a Slave. Gyllenhaal received the Best Supporting Actor of the Year Award at the 2013 Hollywood Film Festival for his "truly compelling, subtly layered" performance as Detective Loki. Reviews were not all positive. Writing in The New Republic, David Thompson declared that the film was "weary after ten minutes" and furthermore "hideous, cruel, degrading, depressing, relentless, prolonged, humorless, claustrophobic, and a mockery of any surviving tradition in which films are entertaining." A mixed review came from Sheila O'Malley of RogerEbert.com, who gave the film 2.5 stars out of a possible 4. She wrote that Jackman's performance grew "monotonous" and that the film sometimes verged on pretentiousness, but was redeemed by a few excellent suspense sequences and Gyllenhaal's performance, whose "subtlety is welcome considering all the teeth gnashing going on in other performances." Prisoners was listed on various critics' top ten lists. The Prisoners soundtrack, composed by Jóhann Jóhannsson, was released on September 20, 2013. The Secret in Their Eyes, an Argentine-Spanish film which includes a theme of suspect kidnapping. Secret in Their Eyes, its American remake. ^ "PRISONERS (15)". E1 Films. British Board of Film Classification. September 13, 2013. Retrieved September 13, 2013. ^ a b c "Prisoners (2013)". Box Office Mojo. IMDb. Retrieved January 10, 2014. ^ "Hugh Jackman to Star in Vigilante Thriller PRISONERS for November 2013 Release". Collider.com. March 15, 2012. Retrieved March 4, 2013. ^ a b c Giroux, Jack. "Interview: The Back-to-Basics Brutality of 'Prisoners'". Retrieved July 28, 2017. ^ "Prisoners (2013)". Rotten Tomatoes. Fandango. Retrieved October 27, 2018. ^ "Prisoners (2013)". Metacritic. CBS Interactive. Retrieved September 17, 2013. ^ Pamela McClintock (October 18, 2013). "CinemaScore in Retreat as Studios Turn to PostTrak". The Hollywood Reporter. Retrieved January 28, 2019. ^ a b Feinberg, Scott (September 23, 2013). "Jake Gyllenhaal to Receive Acting Honor at Hollywood Film Awards (Exclusive)". The Hollywood Reporter. Retrieved April 4, 2014. ^ "Catalog: Audio/Visual – Winners". Key Art Awards. Archived from the original on December 13, 2013. Retrieved April 4, 2014. ^ Giardina, Carolyn (February 15, 2014). "Dallas Buyers Club, Bad Grandpa Win at Make-Up Artists and Hair Stylists Awards". The Hollywood Reporter. Retrieved April 4, 2014. ^ "Prisoners Soundtrack". SoundtrackMania.com. Retrieved August 1, 2014. ^ "Prisoners Soundtrack". Soundtrack.Net. Retrieved August 1, 2014. Wikimedia Commons has media related to Prisoners (2013 film). Denis Villeneuve is a French Canadian film director and writer. 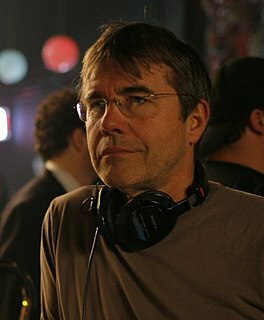 He is a four-time recipient of the Canadian Screen Award for Best Direction, for Maelström in 2001, Polytechnique in 2009, Incendies in 2011 and Enemy in 2014. The first three of these films also won the Academy of Canadian Cinema and Television Award for Best Motion Picture, while the latter was awarded the prize for best Canadian film of the year by the Toronto Film Critics Association. Stephen Roark Gyllenhaal is an American film director and poet. He is the father of actors Jake Gyllenhaal and Maggie Gyllenhaal. The Double is a 2002 novel by Portuguese author José Saramago, who won the Nobel Prize in Literature. In Portuguese, the title is literally "The Duplicated Man." It was translated into English and published as The Double in 2004. Brothers is a 2009 American psychological drama war film and a remake of Susanne Bier's Danish film Brødre (2004), which takes place in Afghanistan and Denmark. The film stars Tobey Maguire, Jake Gyllenhaal, and Natalie Portman, and is directed by Jim Sheridan. Both films take inspiration from Homer's epic poem, the Odyssey. The film received a mixed to positive response and grossed $43 million. Tobey Maguire received particular praise for his performance and received a Golden Globe nomination for Best Actor in a Motion Picture Drama for his performance. End of Watch is a 2012 American action thriller drama film written and directed by David Ayer. It stars Jake Gyllenhaal and Michael Peña as Brian Taylor and Miguel Zavala, two Los Angeles Police Department officers who work in South Los Angeles. 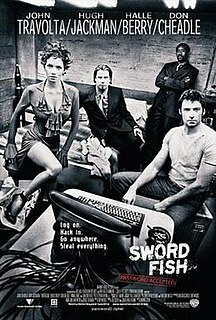 The film focuses on their day-to-day police work, their dealings with a certain group of gang members, their friendship with each other, and their personal relationships. 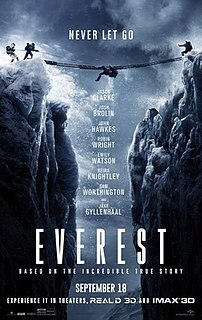 Everest is a 2015 biographical adventure film directed and produced by Baltasar Kormákur and written by William Nicholson and Simon Beaufoy, adapted from Beck Weathers' memoir Left for Dead: My Journey Home from Everest (2000). It stars an ensemble cast of Jason Clarke, Josh Brolin, John Hawkes, Robin Wright, Michael Kelly, Sam Worthington, Keira Knightley, Emily Watson, and Jake Gyllenhaal. It is based on the real events of the 1996 Mount Everest disaster, and focuses on the survival attempts of two expedition groups, one led by Rob Hall (Clarke) and the other by Scott Fischer (Gyllenhaal). Nightcrawler is a 2014 American thriller film written and directed by Dan Gilroy in his feature directorial debut. It stars Jake Gyllenhaal as Louis Bloom, a stringer who records violent events late at night in Los Angeles and sells the footage to a local television news station. Rene Russo, Riz Ahmed, and Bill Paxton also star. A common theme in the film is the symbiotic relationship between unethical journalism and consumer demand. Stronger is a 2017 American biographical drama film directed by David Gordon Green and written by John Pollono, based on the memoir of the same name by Jeff Bauman and Bret Witter. It follows Bauman, who loses his legs in the Boston Marathon bombings and must adjust to his new life, and stars Jake Gyllenhaal as Bauman, with Tatiana Maslany, Miranda Richardson, and Clancy Brown in supporting roles. The Marine 5: Battleground is a 2017 American action film. It is the fifth installment of The Marine franchise and sees Mike "The Miz" Mizanin reprise his role from The Marine 3: Homefront and The Marine 4: Moving Target. This is the first film in the series not to be released by 20th Century Fox.